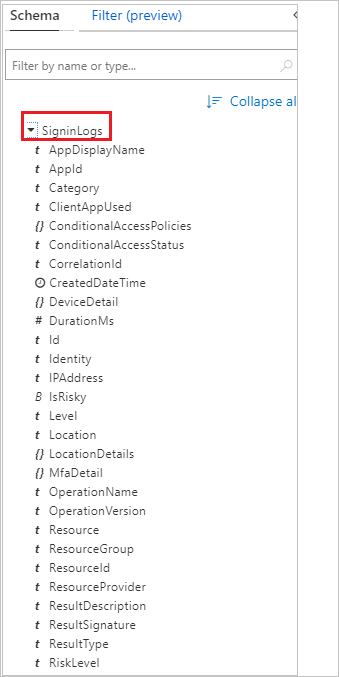 After you integrate Azure AD activity logs with Azure Monitor logs, you can use the power of Azure Monitor logs to gain insights into your environment. You can also install the Log analytics views for Azure AD activity logs to get access to pre-built reports around audit and sign-in events in your environment. In this article, you learn how to analyze the Azure AD activity logs in your Log Analytics workspace. Select Azure Active Directory, and then select Logs from the Monitoring section to open your Log Analytics workspace. The workspace will open with a default query. From the default query view in the previous section, select Schema and expand the workspace. Expand the Log Management section and then expand either AuditLogs or SignInLogs to view the log schema. From the workspace, select Set alert to open the Create rule page. Select the default alert criteria created in the alert and update the Threshold in the default metric to 10. Enter a name and description for the alert, and choose the severity level. For our example, we could set it to Informational. Select the Action Group that will be alerted when the signal occurs. You can choose to notify your team via email or text message, or you could automate the action using webhooks, Azure functions or logic apps. Learn more about creating and managing alert groups in the Azure portal. Once you have configured the alert, select Create alert to enable it. 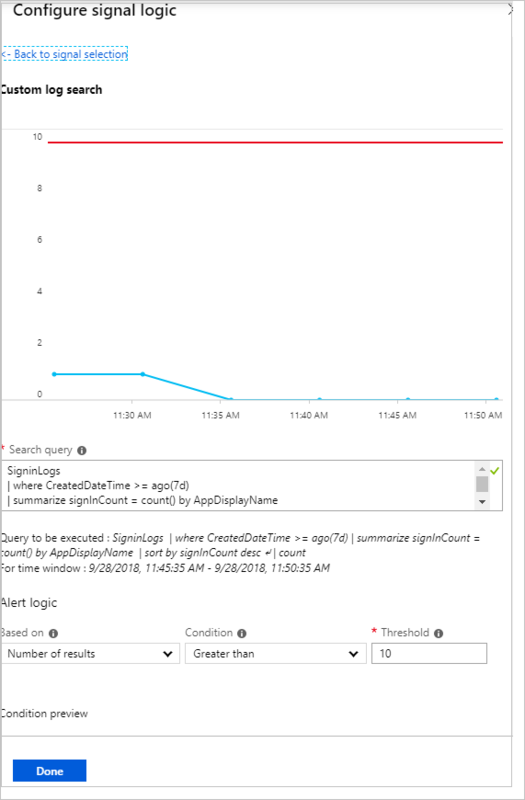 You can also download the pre-built log analytics views for Azure AD activity logs. The views provide several reports related to common scenarios involving audit and sign-in events. You can also alert on any of the data provided in the reports, using the steps described in the previous section. Users Performing Consent: This view shows reports related to user consent, such as the consent grants by user, sign-ins by users who granted consent as well as sign-ins by application for all consent-based applications. Learn how to install and use log analytics views for Azure AD activity logs.